Hello, Radiant One and welcome to this episode in which I am going to be sharing with you 5 signs, the 5 signs that your business is currently shifting, either shifting direction or that it’s expanding into new products or services or realms. However, the signs that I’m going to go through and also the tips that I’m going to be sharing at the end of what you can do as your next step does also apply if you’re someone who’s currently in a job that you don’t love. So if you’re someone who is in a job you don’t love, stay and listen with an open heart and an open mind because I’m pretty sure that you are going to be recognizing the signs as well and that you can also gain value from those steps that you can take at the end. With that out of the way, if you’ve walked with me for a while you’ll know that love is the way to me. It’s where we come from. It is what you do. You are created as an expansion of source which is love and as you were created as an expansion of source, you too create as an expansion of source. You create as an expansion of love. To me, that is your business. That is your products. That is your services. That is based from that. You basically expand out into that. And within nature we have these “natural” cycles of expansion, of birth, of death, of rebirth, and over and over and over again. But somehow being human we seem to have lost that notion and so when we’re a business owner who’s been in place for a while and we have our business and our products and our services in place, that seems to be it. Like, “this is it,” not realizing that you are part of source. You are source and so it is normal and natural for you to continually expand just as when you look at the oceans ebbing and flowing, just as you look at trees growing, expanding, coming out with new leaves, withering, dying. It’s a continuous cycle and for some reason, like I said, we as human beings seem to have lost that wisdom or notion that we are actually part of that. So if you’re in a place where your business might be completely shifting direction, know that that is completely normal and natural. It’s part of nature. That’s where the word “natural” comes from. Second thing I want to say before we dive in is that as human beings, we have free will and free will means that whatever comes up for you or whatever’s calling you might not be what you want to do and that’s okay. Normally, I would say that if it’s tugging your heartstrings, it’s probably a good idea to follow or to walk with, at least for a while. But ultimately you are the creator of your own universe and you get to choose and decide whatever it is that you want to bring forth. So free will. Okay, with that out of the way, I am going to dive in to the 5 signs. So the first sign is a sign of deep joy, excitement, exhilaration, of satisfaction. It is when you think about this thing, whether or not it is fully formed as an idea or a vision or conscious to you or just simply a tiny grain currently, it will be filled with that. It will be filled with those emotions or feelings of joy and excitement, exhilaration, of satisfaction because that is the universal heartbeat. It is the make-up of everything that the universe is at its core so when that is calling you, that’s what’s coming forth. So deep joy, excitement, exhilaration, satisfaction, content, fulfillment – all of those things that truly fills us up. That’s number one. That’s the first sign. The second sign is fear and it might not be raging fear in the sense that you – full-on panic attacks or trouble breathing or waking up in the middle of the night just out of your mind with anxiety. It can simply be showing up in a milder form, in the form of worry and concern. It can be showing up in the way of like, “What does this mean to my current business, for my current clients? Where will this end? How will I do this?” All of those I want to say fear-based thoughts but not in the way of negative, shaming, guilting questions. These are relevant questions and so it is only if you choose not to answer those questions that they then become I would “an issue” or a problem. They’re relevant questions so I invite you to answer those questions. If that comes up, begin exploring, researching, not ignoring, not suppressing but actually allowing those questions to be heard and actually answered as well. So fear – and I want to say the level of this also depends on how big of a “shift” or a dream or expansion that is coming through. I would say the bigger it is, the stronger the current of fear can be for this. So that’s the second sign: fear in one of its many forms. The third sign is what I call surprise. That is only until you – the more that you actually lean into this, the more you trust, the more you surrender, the more you begin following that intuition and the nuggets that you’re getting, the more you’ll understand that the whole trajectory of your life, the whole trajectory of your business has been leading up to this point so everything will at one point “make sense” but it might not be initially in the beginning. In the beginning, you may just simply be caught by surprise by this, whatever “this” may be. That’s when you can begin to experience discomfort, like there’s something that’s off and you don’t know what it is, something’s not right, and if you continue to suppress or ignore it, you will probably experience some form of stress. Because if you’re continuously trying to ignore or suppress whatever is calling you, that will create a strain on your system and stress is bound to happen. That’s again actually quite normal and natural. Stress is a sign that there’s something that you’re ignoring and it’s for you to look at. So the fourth sign is a discomfort or even stress. The fifth sign that your business is changing direction or shifting, expanding, is people showing up and asking for the thing out of the blue. You might have just had a thought about this and then someone appears at your doorstep or you receive an e-mail or a friend is asking or you’ll see it on the news. Some people again can show up and start asking you for this thing that you have not yet created but has just been percolating within you. So the fifth sign, and that’s one of the great signs that something’s probably right is when people start asking you for a service or a product that you have been thinking about but don’t yet have. That’s the fifth sign. Again, I want to emphasize the free will of this. People may be asking you for things that you don’t want to create or don’t want to have within your services or your products and that’s fine. Then it’s just about saying no and then probably perhaps even leading them in another direction or giving them a referral out. But more times than not, I hear it from my clients all the time and I see it within my own business as well. As soon as I begin to start thinking about something, people start asking for it. So that’s the fifth sign: People asking for that thing that you have either yet to create or about to create. Yes. What to do if your business is expanding or changing direction? Now, what do you do if these are the signs that are showing up and you’re not really sure what it is or the direction you want to take your business in or the expansion that you are expanding into? I have 3 ways and if you know me, you’ll know that for me clarity is the name of the game but only if you add it with action. Clarity is the space and the realm of the divine feminine. It’s where the gnosis, the intuition, the wisdom, and the knowledge lies but it is only when we combine it with the realm of the divine masculine, the action, the building, the creation, the foundation that true magic happens and deep satisfaction and joy, content, and fulfillment is actually your state. I want to say in terms of action it doesn’t necessarily have to be giant, huge leaps to begin with. Yes, there will be times when our dreams are so big and they’re calling us forth that there will times where we leap but if you’re someone who currently holds a business that is up and running or you’re in a job maybe that you don’t love and you want to change that, that is “time-consuming” so it’s about maybe carving out 3 hours a week to focus on that new thing that is asking to be born through you. It doesn’t have to be that big. I’ve had people do 15 minutes every morning before going to work because 15 minutes a day in a week becomes an hour, in a month becomes four, and in a year becomes a whole lot more. So very often we do not acknowledge the power of taking small steps and that’s always something that encourage my clients to do is to take small steps and then see. Because it’s all of the small steps that are going to lead you to where it is that you want to be or for you to create what it is that you want to have be your life and your business. So don’t disregard the power of a small step or a small action step. So there are 3 ways I suggest you can move forward. 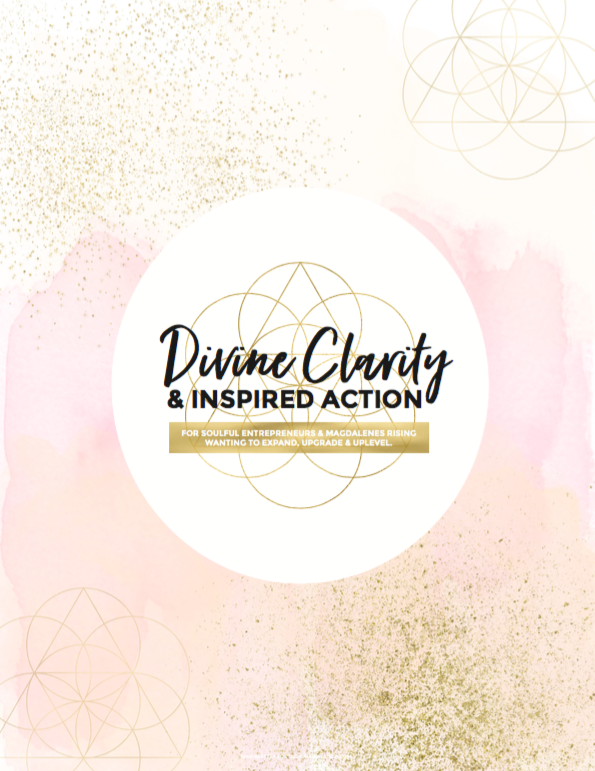 Number one is that if you don’t have my free Divine Clarity and Inspired Action Guide, I invite you to go ahead and download it. You can get it at Mariaestela.com/DCIA. It will help you download, pour forth everything that is within the realm of your divine feminine essence and bring that out into the world on paper. Secondly, it will activate and engage your divine masculine essence of creation, building, action, and foundation so that you can begin building and taking steps toward bringing that to life that is asking you to, whether that be like I said a new direction of your business or simply an expansion of it. The second thing you can do is that you can go ahead and apply for a free discovery session with a spiritual business coach AKA me. You can do that if that tugs your heartstring. You can go ahead and apply at Mariaestela.com/apply. It is a real session. In that session, we will be gaining clarity over everything that is calling you currently and I will support you. There will be commitment. You will be committing to some action steps at the end of our session and I will be following up with you on that as well to make sure that – to hold you accountable towards your dreams and make sure that you’re actually moving towards the thing, the reality that you want to have in your life and in your business. What’s really important to emphasize in terms of this is that it needs to be a friend who’s able to hold space for you. It needs to be someone who’s able to listen and not come up with suggestions for you to check out or uncover or research. It needs to be you and your wisdom that is coming through. So other than holding space, listening, they also need to be able to ask questions, to help you, guide you, nourish you in getting that out, gaining the clarity and knowing what action steps to take. So those are 3 ways that you can move forward if these 5 signs are of your business shifting direction or expanding is showing up for you. What is the biggest revelation that you’ve had going through this episode?